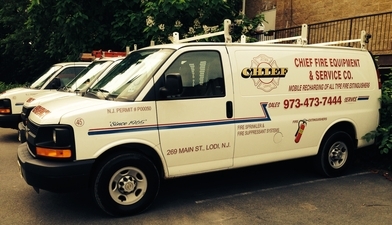 We are Chief Fire Equipment & Service Co., Inc., located at 269 Main Street, Lodi, New Jersey. We are your best source for fire protection and prevention services in New Jersey! We are staffed with 14 trained technicians. Our technicians are trained by manufacture specialists for the installation, inspection, maintenance and servicing of the fire suppression systems and are educated in the National Fire Codes- N.F.P.A. #25, 10, 17. Our technicians have been providing fire sprinkler, fire extinguisher and fire suppression services to businesses large and small in New Jersey since 1965. We are D.O.T. approved retest facility for many years and currently licensed for all fire equipment services in New Jersey. For aquatic hobbyists and home beer enthusiasts,who are constantly looking for CO TWO gas to feed their live plants or run their kegerators. Our facility is equipped with a 6-ton carbon dioxide receiver tank that is regularly filled with beverage grade CO TWO gas. As for Emergency service calls, Chief Fire Equipment has a 24-hour live person answering service seven days a week. We are always there when you need us!